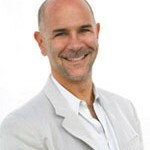 In this article, Mike Zappy transcribes the contents of a talk on cannabis and how it’s going to change ‘life as we know it’ that he had intended to deliver at a Tedx event in Boca Raton. The text was approved by the organizers and Zappy was scheduled into the event but a few days later he received an email from the same organizers cancelling his talk. They said that ‘Boca Raton was not ready for a talk about cannabis’. Zappy wants to take a stand against what he believes is the hypocrisy of Tedx, an event that is supposed to break barriers, and is publishing his talk in full here. I’m here today to explain to you “How Cannabis is Going to Change Life as We Know It,” and why you don’t need to be afraid. What I’m speaking to you about is somewhat controversial, but also inevitable … so what I’d like to do is help get everyone over their fear of what cannabis is and what it isn’t. For the last 25 years I have wanted to be in the cannabis business, but never really wanted to go to jail so I just waited. I always knew there was something positive about it beyond its psychoactive effect; something intuitively told me that there was a healing component to it. Unfortunately there was nothing concrete for me to point to; the plant was made illegal back in the 1930s so there have been no major scientific studies done to back this up. I’ve seen the amazing healing power of this plant in my own life … a friend of mine had a daughter who was severely brain damaged during child birth, the family spent every moment of their life tending to her trying to give her joy, but it was unclear how much their efforts were really doing. The family was desperate and decided to break the law and try giving her cannabis oil, the results were shocking, within seconds of taking the cannabis oil her seizures stopped and she was able to enjoy life at a whole new level. The question is how can something that sounds that amazing be unavailable and even illegal? I knew that to understand the answers to these questions I needed to start by studying the cannabis plant itself, and here’s what I found. Cannabis Sativa comes in two varieties, one is the traditional marijuana plant that is smoked, vaporized, and eaten for its psychoactive effect. The other is called industrial hemp, which is used worldwide as a food ingredient and to make products like rope and clothing. What is virtually unknown is that there are over 70 different elements in the plant including a group referred to as Cannabinoids. What makes this really interesting is that each one of us has an endocannabanoid system in our bodies that allows us to interact with these different elements. The question is … why would we have this system inside our bodies unless we were supposed to be interacting with this plant? 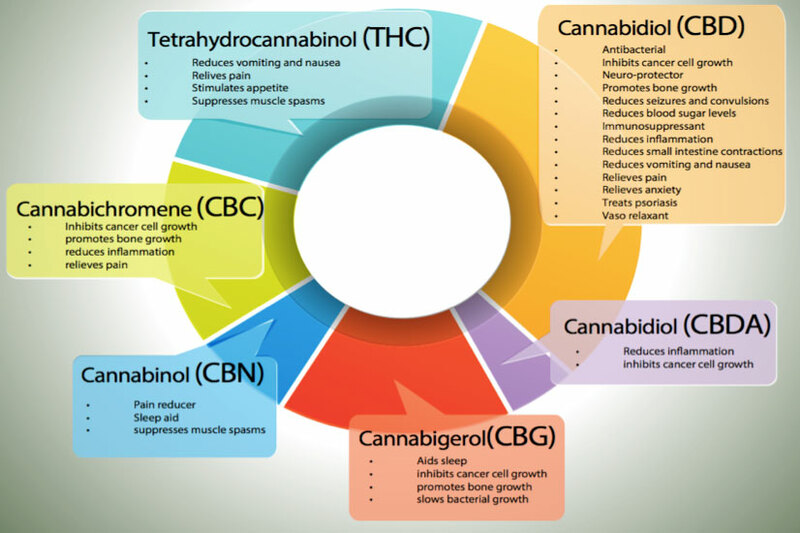 This chart shows just a few of these elements found in the cannabis plant … there’s THC that produces the feeling of being high, but that has also been known to alleviate nausea and stimulates appetite, which is why it has been recommended to patients going through chemotherapy. Then there are the also the Cannabinoids with their different names and abbreviations. Most widely known today is Cannabidiol or “CBD”, this is the one that has caught peoples attention with its ability to potentially heal seizures in children like my friend’s daughter. It turns out that the natural ability of CBD to reduce inflammation is why it has shown to be effective at eliminating lesions on the brain that cause the seizures. This natural inflammatory can also be effective against the pain associated with diseases like diabetes, which is painful specifically because of the inflammation in the body. What wasn’t realized until recently is that the Industrial Hemp variety that is non-psychoactive, has naturally high levels of CBD, higher than are found in the typical marijuana plant. Industrial hemp characteristically has less than 1% THC and high levels of CBD. The evidence is showing that these Cannabinoids are not specifically a cure for epilepsy, colitis, diabetes, or cancer, but what they’re doing is helping boost your own immune system so you can naturally fight off whatever it is that’s ailing you. A friend of mine who was the chief science officer for a major vitamins company, began studying CBDs a year and a half ago. After studying it for about a year he felt he knew enough about CBDs to test it on himself to help combat the intestinal colitis which had been ruining his life. He began taking the CBDs and within a couple of weeks all of his symptoms disappeared and it has now been 6 months and he has not had a single episode. Einstein is famous for saying, “You can’t solve any problem with the same consciousness that got you into the situation.” This means to me that if we want to solve the big issues in society like violence, anxiety and addiction, we need to change people’s consciousness. Nature knows that people are highly stressed and is trying to bring this plant out to change people’s collective consciousness and bring about healing to our most menacing diseases. Prohibition is being lifted after more than 70 years and every application will play a critical role in your life. Hemp is going to once again become the number one crop in the United States and will again be used in a wide spectrum of applications that add value to our everyday lives. Because of the natural strength of its fibers, it has the potential to be the base material in most 3d printers. Scientist recently became excited about a material called graphene, which has incredible conductivity and is touted as the material that will allow us to have a computer that folds up like a newspaper. The graphene mining stocks are all of 10x or more. Interestingly enough, it turns out that hemp is actually a better conductor than graphene and it doesn’t need to be mined. It grows quickly and is very cost effective. Recently the government allowed the growing of industrial hemp, leaving it up to the states to regulate the growing. Unfortunately, the law currently says that the plant needs to stay in the state that it is grown in, which is why most of the hemp being sold today in the US is produced in Europe and Canada. Everyone here today owes it to this plant to make sure that it becomes available as soon as possible by petitioning their government officials and getting out to vote for cannabis related issues. Even today Marijuana is designated as a “Schedule 1” drug in the United States. The definition of a Schedule 1 drug is that it is highly addictive and has no medical benefit. How can it still be claimed to have no medical benefit? Because we have allowed a handful of special interest groups control our access to the future we deserve! When future civilizations look back, they will see that the suppression of this plant was one of the biggest human atrocities to ever take place, so let’s make sure that they see our generation as the one that took a stand and righted this wrong. Mike “Zappy” Zapolin is the CEO of Zappy, Inc. a vertically integrated cannabis company focused on the medical and consumer applications of the product, projected to be $49 billion in the next few years. Zappy is the visionary behind such Internet brands as Music.com, Beer.com, Computer.com, Creditcards.com, Debt.com, Diamond.com, PrescriptionDrugs.com, Etc. Zappy has been featured multiple times on NBC’s "Today Show," on TV networks ABC, CBS, CNBC, and CNN, and is the creator of the Harvard Business School elective "eBusiness,"
Zappy began his career at Drexel Burnham Lambert, later becoming one of the youngest Vice Presidents in the 100-year history of investment bank Bear Stearns. Along with Deepak Chopra, he is producing a documentary film titled "The Reality Of Truth" www.TheRealityOfTruth.com which advocates using ancient wisdom for modern problems.